At Beauty Entourage we take every opportunity to give back to the community, support charities we believe in, and create a voice for those unheard. The annual Making Strides Against Bre ast Cancer walk in Hartford hosted by the American Cancer Society is near and dear to our hearts. Many of us have someone in our lives affected by this disease. Together, we can create change which will facilitate the research necessary to create treatment. We will find a cure. Last month, we attended the kick off breakfast hosted by The American Cancer Society to jump start fund raising ideas, hear survivor stories, and get inspired by the energy of so many people affected by the disease rallying to stand up and do something. 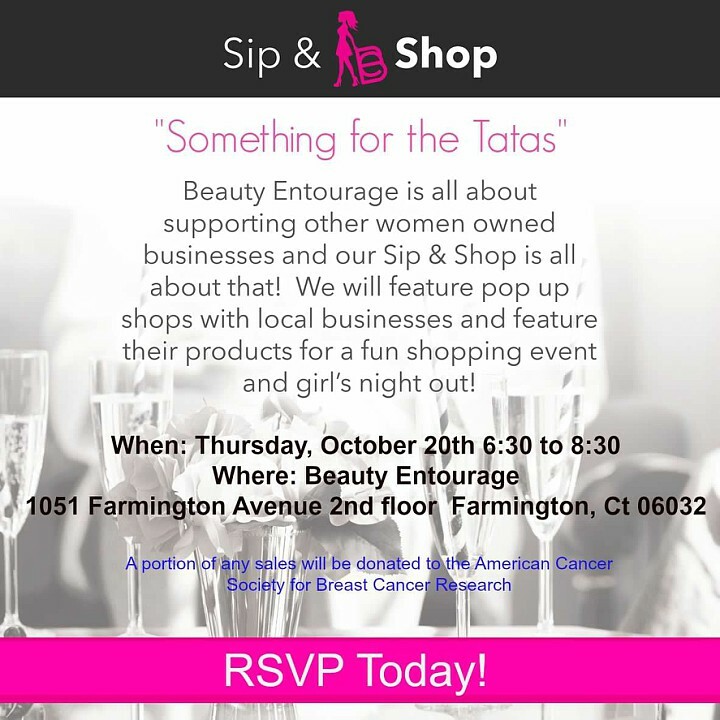 To continue our fund raising and incorporating our Beauty Entourage energy, we are hosting our first Sip N Shop event called “Something For the Tatas“. This event will feature local vendors, focusing on raising awareness of Making Strides Against Breast Cancer. Proceeds will go toward our team donation to the cause. Meet featured women owned businesses for the evening for a unique event that empowers women and instills confidence! Sip, shop, and have some fun! Unveiling an amazing boudoir photo shoot featuring a breast cancer survivor. Everyone should feel beautiful. This event will leave you feeling better than ever and possibly capturing that confidence on film! Ticket includes one PINK drink, a mini swag bag and a donation to the American Cancer Society. Donations will be made on behalf of a percentage of purchases made that evening. Theme of the night: Something For the Tatas. Our upbeat approach to something that has affected all of us in some way or another. Tickets can be purchased here. Featured Vendors include Boudoir Photographer Rachel Girouard, Pure Romance Lingerie hosted by Nicole Simone, Beauty Entourage Hair & Make Up team doing Demos of lashes and a smokey eye, and MiSS Mixology serving up the PINK drink for the evening! The event will be held at our headquarters on October 20th from 6:30 PM – 8:30 PM. If you can’t make it to the event, we encourage donations towards our team goal. We also invite you to walk with us on October 16th at Bushnell Park to rally our support for the cause. Our team page for donations and sign up is available here.